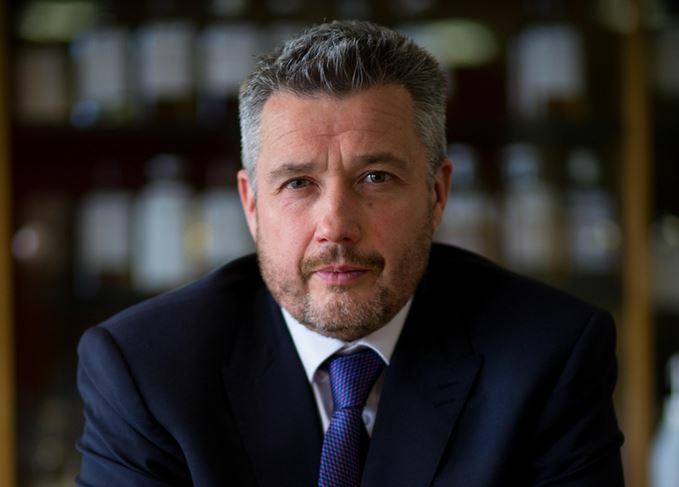 Serendipity may have brought Sandy Hyslop into Scotch whisky, but he’s since become responsible for some of the best-selling blends and single malts on the planet in his role as director of blending at Chivas Brothers. And yet he still feels that the likes of Chivas Regal and The Glenlivet are somewhat misunderstood, as he tells Richard Woodard. As interviews go, this one gets off to a distracting start. As Sandy Hyslop and I try to recall when and where we last met (we can’t), snippets of conversation drift across the room. The slim man in his 70s seems more intent on scribbling his autograph across the front of a formidable pile of football programmes than on the briefing he’s getting from a member of the Manchester United press team. The signature reads ‘Denis Law’, and this legend of Manchester and Scotland football is here, in Manchester’s The Loft venue, to play his part in the launch of Chivas Regal 50 Year Old The Icon, created by Hyslop to mark the 50th anniversary of Manchester United’s European Cup triumph against Benfica. The Icon – only four bottles made, of which one will be given away, two will be auctioned for charity and one will stay at the Strathisla distillery on Speyside – is a rarefied endeavour for a man responsible for blending two of the four best-selling Scotch whiskies on the planet (Ballantine’s at 6.7 million cases and Chivas Regal at 4.4m cases), not to mention the numerous other whiskies in the Chivas portfolio. But it’s a way of showing off Chivas Regal’s new partnership with Manchester United and – more importantly from a whisky point of view – of driving home Chivas’ ‘Success is a blend’ marketing message. Players in a football team; grains and malts in a blended Scotch… you get the idea. Now director of blending at Chivas Brothers, Hyslop was appointed as master blender of Ballantine’s in 2005, only the fifth person to hold that post in almost 200 years. Blended Scotch has been his professional lifeblood for 35 years, but his entry into that world owed more to serendipity than design. ‘My father had an antiques business,’ he recalls, ‘and, when I left school, he was really keen for me not to go to university. I had a place to go and study chemistry, and a job came up at the local whisky company in Dundee, to work in the laboratory one day a week, and to study chemistry. The company was Stewart & Son, of Stewart’s Cream of the Barley fame, part of what was Allied Breweries and which, after numerous corporate renamings and mergers, became part of Chivas Brothers and Pernod Ricard. Stewart’s was a small outpost of the empire, where everybody had to do a bit of everything – production, bottling hall, inventory, nosing of samples – which Hyslop acknowledges has stood him in good stead ever since. Master blenders are rarely, if ever, overnight sensations. Hyslop’s first big break came almost a decade later, when he was invited to spend a day a week in Dumbarton, honing his organoleptic skills alongside Ballantine’s blenders Jack Goudy and Robert Hicks. Goudy and Hicks proved contrasting mentors. ‘Chalk and cheese! Jack was super-serious; I got on perfectly with him, but he could be brutal with people – he didn’t suffer fools gladly at all,’ says Hyslop. Among other things, it taught Hyslop that, while learning from his mentors, he had to forge his own opinions and ideas, not become a facsimile of Goudy or Hicks. ‘As I say to the younger members of the blending team: listen to my words, but don’t use my words. You’ll never become a blender using my words – get your own words. And above all? ‘We need to find people that are passionate about Scotch, and I’m not just saying that; if you’re not passionate about Scotch, if you don’t love cask maturation and different expressions and how flavours come together, you can never do this job, because you’ll never stick it. ‘I travel north every Monday, Tuesday to nose the new distillate from all of our 14 distilleries, to make sure they’re all in order. I check every single charge with the distillery managers, I’m selecting all the casks that that’s to be filled into. But do consumers also get a kick out of it? Scotch whisky’s global profile has arguably never been higher, but a loud minority is nonetheless happy to dismiss blends in favour of single malts. ‘You’re right and it would be good to be able to get that message across to consumers, about the complexity and the balance involved in making a blended whisky, and trying to get across that story of how you’re trying to make something that’s really quite multi-faceted,’ says Hyslop. With Chivas Regal 12, it’s not just a matter of getting the flavour right, but also the finish, he explains. ‘When you take that glass of Chivas Regal and you drink that glass of Chivas Regal, and you lay that glass down, I want it to take a good bit of time to subside on the palate; I don’t want somebody reaching right back for that glass for a drink again. However, it’s not only blends that are misunderstood, Hyslop believes, but also single malts. The Glenlivet now sells 1m cases a year – more than many successful blends – and the process of maintaining quality and consistency for a product like Glenlivet 12 Year Old has become a major task. Phew. With that, our time’s up and we’re away to the launch of Chivas Regal 50 Year Old The Icon, with Hyslop and Denis Law sharing the stage like one of the more unlikely Scottish comedy double acts. Judging from a few of the somewhat colourful anecdotes, Law is ignoring every word of that earlier press briefing, but he does confess that he only drinks one glass of Scotch a year, ‘at Hogmanay’. Maybe he should spend more time around the infectiously enthusiastic Sandy Hyslop. The whisky was made to mark the anniversary of Manchester United’s 1968 European Cup win. The travel retail range will explore the blended Scotch’s core flavour characteristics. From Prohibition to the 1950s, the life of one of Scotch whisky’s greatest entrepreneurs. The whys and wherefores of diluting your dram: when to add water, how much and why.